WaveSpring® Technology is here and it is coming to a shoe near you! 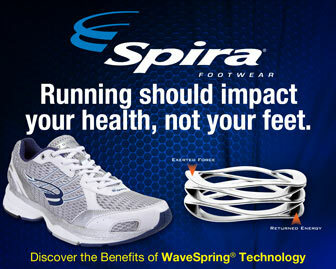 Spira’s® patented WaveSpring® technology may be the most significant advancement ever achieved in the footwear industry. * WaveSpring® returns energy with every step. Unlike traditional shoe midsoles made primarily of foams, rubber compounds, or polymers, WaveSpring® technology stores and disburses energy with every step. Testing performed at Michigan State University in 2001 reported that 87% – 96% of the energy is returned from the WaveSpring®. This is the highest energy return score for any midsole material ever tested. ** As a result, our footwear not only cushions, but returns energy. In a very real sense, the WaveSpring enables you to recycle your own energy! One of the remarkable benefits of the WaveSpring is its ability to reduce peak impact forces by about 20% over traditional midsole materials. When engaged in high impact activity like running or jumping, where peak impact is four to five times body weight, a reduction of 20% is quite significant. It is as if a 200 lb person suddenly weighs 160 lbs for purposes of determining stress on the body. The stress reduction can in turn reduce injury and allow for faster recovery time following vigorous activity. For example elite marathon runner David Cheruiyot, won three major marathons, Istanbul, Singapore and Houston in a four month period. He credits his Spira shoes for his performance.